This question could easily have a dozen different answers if you asked a dozen different people. So I’ll tell you which lottery statistics analysis tool I personally keep coming back to. Beacuse to me, that’s the got to be the best tool. 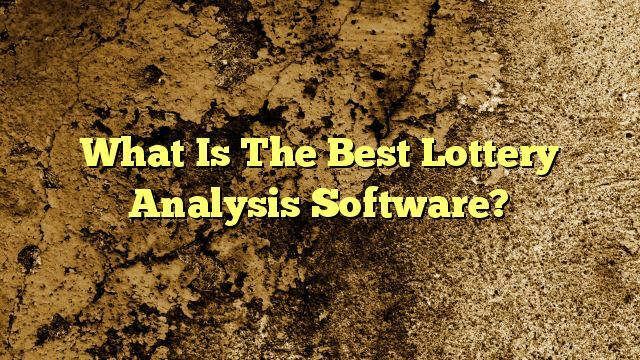 A lot of lottery software is really badly designed, and frankly bloody hard to use. Before I direct you to my favorite tool, I have to warn you – this kind of analysis software is never push-button easy. It never will be. These programs are just tools to analyse lottery results and try and spot trends that may be to your advantage. I don’t think any tool is ever just going to do that automatically and give you numbers to play. At least, not one that is worth using anyway! Don’t get me started on the ‘miracle jackpot software’ programs… only one person wins when you buy those, and that’s the scumbag selling them. So be prepared to put some effort into learning the software first. Actually read the manual! Then commit to using it for at least a few weeks so you start to really get the idea of what is does. If you’re starting to like the way it works, then stick with it for a few months to really get the hang of it. Only then will you know you’ve found the right analysis tool for you. It’s also a lot cheaper than many other tools out there – AND it comes with lifetime software updates (there have already been a bunch of updates already too, all of which existing customers got free of charge!). I’ve tried lots of different software over the years, but for now at least, this is the one I keep loading up. That says a lot! One day something better may come along, but meanwhile I’m going to stick with Looper as my current favorite. You can read my full review of it here to see if it might be what you are looking for too.